We understand that you might have some questions when considering to apply to the Police Service of Northern Ireland. From being eligible to submit an application to what to wear at your Assessment Centre, you should be able to find the answer to any burning questions within the content below. Click on each of the headings to read some common questions and answers regarding the recruitment process. If there are other questions that are not answered below then please email info@joinpsni.co.uk with your query and the Recruitment Team will do their best to help. I would like to contact the Deloitte Recruitment Team by phone. Can you advise me of your phone number? So that we have a detailed documentary written record of transactions between candidates and the Deloitte Recruitment Team and for security reasons, all communication must be handled via email. We therefore cannot discuss your application via telephone. Please do not telephone Deloitte reception as they will not be able to transfer your call. We would ask that you email all queries to the Deloitte Recruitment Team via info@joinpsni.co.uk. We promise to answer all your queries in full as quickly as possible (by no later than 10 working days following receipt, usually much sooner), so please feel free to email us and we will help. I would be interested in other career opportunities with the Police Service of Northern Ireland. A career in the PSNI offers many opportunities for progression and development.Within PSNI there is a wide network of employees who perform a range of vital roles to support and assist uniform colleagues.These varied roles include for example media, legal, human resources, crime scene investigation, finance or occupational and wellbeing which are separate from the police officer recruitment process. PSNI advertises police staff roles in the local papers, social media or online at www.psni.police.uk/inside-psni/careers-in-the-psni/police-staff-recruitment/ and we would welcome you to apply for these roles when they are next advertised. Do I need a degree to qualify for the role? No, you do not require any kind of degree to qualify for the role. Please see the Education Eligibility Criteria section of our website for details on the education criteria. Do I require a diploma in policing or similar qualifications? No, you do not need any kind of policing qualifications. During your 23 week training course at the Police College you will be trained fully and will graduate with an Advanced diploma in Policing. I am confused by the education requirements and do not know if my qualifications will be equivalent / accepted? We appreciate that many people wanting to apply to the PSNI will have a variety of qualifications other than GCSEs, either obtained in the UK or abroad. Often, qualifications other than GCSEs can be deemed equivalent so we would encourage you to apply and we will consider your personal academic achievements to assess equivalency. Please note that you must be able to demonstrate equivalency to a Grade C in both English Language and Maths GCSE, as well as three other subjects. As a starting point we would ask you to refer to our Education FAQs as you may find your particular query on education equivalency answered there. If, having considered the guidance supplied online you are still confused in any way, please feel free to email the Deloitte Recruitment Team via info@joinpsni.co.uk and we will do our best to guide you. I don't have a specific GCSE in English Language or Maths. Do I meet the eligibility criteria? You must be able to provide a GCSE at A*-C grade in both English Language and Maths in order to meet the eligibility criteria. If you do not have a GCSE in English Language or Maths, you may have a qualification that is equivalent to GCSE English Language or Maths. Please check the 'Equivalent Qualifications' table accesible below. If at this time you do not possess the required GCSEs (or equivalent), we would encourage you to investigate options now that may allow you to meet the education criteria in time for the Assessment Centre stage of this recruitment process. For example, during Autumn 2018, some local Further Education Colleges are offering fast-track Level 2 courses (such as Level 2 Essential Skills Literacy / Communication and Level 2 Essential Skills Numeracy / Application of Number) which are the equivalent to GCSEs and which could allow you to meet the eligibility criteria. If you successfully complete a Level 2 course in time for the Assessment Centre stage, qualifications obtained will be considered. Please get in touch with your local College for details. Please note that all qualifications must be dated on or before 8th January 2019. I achieved a grade C in my GCSE English – Talking and Listening, but a grade D in my GCSE English Language exam. Do I meet the eligibility criteria? Unfortunately you do not meet the eligibility criteria. Although GCSE English – Talking and Listening is listed on some examination board's GCSE certificates, it is not a standalone qualification. All candidates need to have achieved a minimum of a grade C in GCSE English Language. I've lost my original GCSE certificates. Do you accept a provisional statement of results? Provided that you meet our eligibility criteria (i.e. have a minimum of 5 GCSEs at A*-C grade (or equivalent), including Maths and English Language), you will be able to sit the Assessment Centre on presentation of your provisional statement of results. However, we will require you to provide us with your original certificates or a final certifying statement of results, for all qualifications that you are presenting. Please write to your examination board now, in order to request either replacement certificates, or a final certifying statement of results. Some examination boards take a significant time to process these requests, and you may therefore miss a deadline which will exclude you from the recruitment process. Do not wait until you receive an Assessment Centre invite to request your replacement certificates. 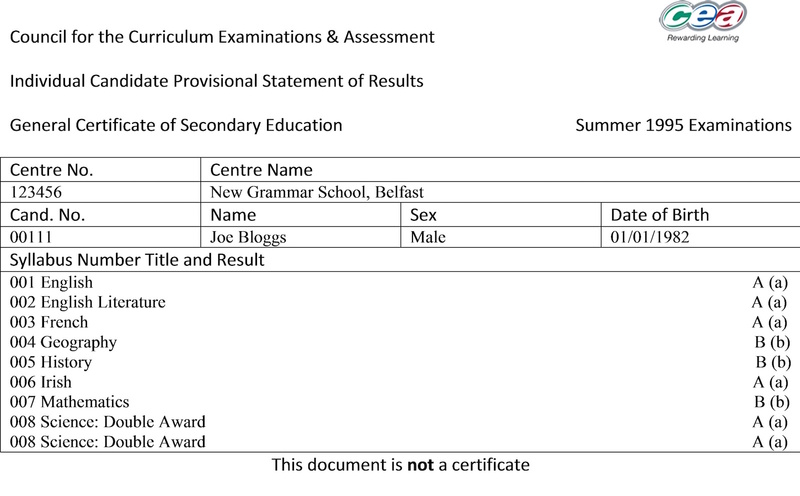 An example of an original GCSE certificate (left) and two final certifying statement of results (centre and right) are given below. All of these certificates are acceptable. An example of a provisional statement of results is given below. This will allow you to sit the Assessment Centre, but you will need to provide your original certificates or a final certifying statement of results for all qualifications that you are presenting. I studied for my qualifications in the Republic of Ireland. Do I meet the eligibility criteria? Please consult the Ofqual framework at http://ofqual.gov.uk/help-and-advice/comparing-qualifications/ and follow the links to 'Other Countries' > 'Outside the UK' > 'compare European qualifications' > 'Compare national qualifications frameworks' > then select the UK and Republic of Ireland to compare. The most common equivalent qualifications studied in the Republic of Ireland are Leaving Certificates. To meet the eligibility criteria, you need to have obtained a Leaving Certificate in 5 subjects, which must include Maths and English Language. We are aware that the grading system for the Leaving Certificate underwent an update in 2017, therefore the specific grading / level of the Leaving Certificate required for police constable recruitment and the subsequent equivalency to UK GCSE A*-C grades is currently under review. We would encourage you to submit an application and should you be invited to the Assessment Centre stage of the recruitment process, your Leaving Certificate qualifications will be reviewed then on a case by case basis. In the meantime, if you have any queries regarding your Leaving Certificate qualifications please contact info@joinpsni.co.uk and the Recruitment Team will endeavour to give you guidance. I studied for my qualifications in Scotland. Do I meet the eligibility criteria? Please consult the Ofqual framework at here. The most common equivalent qualifications studied in Scotland are Standards. To meet the eligibility criteria, you need to have obtained 5 credits at Standard Level, including Maths and English Language. I don't have 5 GCSEs at A*-C grade, but have higher level qualifications (e.g. A-levels or a Degree). Do I meet the eligibility criteria? 3 A-levels in English Language, Maths and Chemistry at grade C, in addition to 2 x Level 2 qualifications in ICT and Business Studies. This candidate meets the eligibility criteria, as their 3 A-Levels are at a level higher than GCSE (Level 3 on the NQF) and include English Language and Maths; and their 2 Level 2 qualifications are equivalent to GCSEs at A*-C grade. In total, this candidate therefore has 5 qualifications at GCSE grade A*-C, and meets the specific English Language and Maths requirements. I have a BTEC qualification. Do I meet the eligibility criteria? Unfortunately a BTEC qualification alone, will not meet the eligibility criteria. Although a BTEC qualification is equivalent to 5 GCSEs at A*-C grade, candidates must have a GCSE at A*-C grade in English Language or Maths (or equivalent qualification). The only BTEC qualifications that are equivalent to GCSEs in English Language or Maths, are BTEC qualifications in English Language or Maths respectively. I sat my GCSEs before I changed my name due to marriage / change of name deed poll. Do I meet the eligibility criteria? If your certificates are in a name other than that which you applied in, you will need to provide us with documentary evidence (i.e. either your Marriage Certificate or Change of Name Deed Poll Certificate) to verify that your certificates relate to you. Please bring the original and a copy to your Assessment Centre appointment. We have provided an example below. Example: "My certificate is in the name of Janine Smith, but since I did my exams I have married and am now known as Janine Bloggs. I applied as Janine Bloggs, but want to present my certificate in the name of Janine Smith." In order to demonstrate you meet the Eligibility Criteria, you will need to provide your original (for review) and copy of your marriage certificate to accompany your certificate. This will help us to verify your certificate. For more details on the equivalent qualifications to GCSE Maths or English, click here. 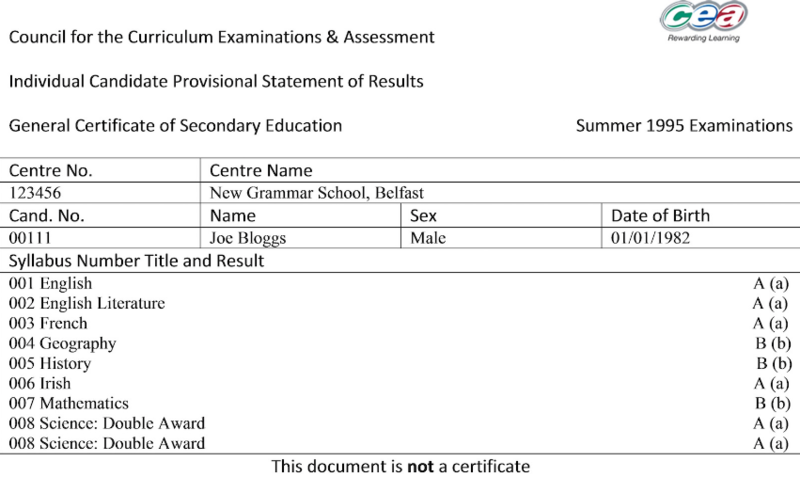 I have lost my GCSEs / My GCSE certificate will not have arrived by the date of my assessment centre, is this an issue? You will be required to present evidence of your GCSE qualifications at Assessment Centre stage. We advise applicants to request replacement certificates or a final certifying statement of results from the relevant Exam Board now, noting that certain Exam Boards take a long time to process such requests. We must stress how important it is for you to provide evidence of your qualifications so it is in your interest to secure the appropriate proof of your qualifications. Please do not wait until you are invited to Assessment Centre to start this process. I am an EU citizen and want to apply to PSNI. I am worried about the implications for me post-Brexit if I apply. PSNI does not yet have any formal guidance from Government as to the implications of Brexit on immigration legislation and their possible impact on police recruitment. Such guidance has not yet been formalised, but it is expected that this will become clear gradually between now and 2019. The only guidance we can currently give you is as per the current Nationality Eligibility Criteria published on our website and those stipulations remain applicable until further notice. Due to the Brexit vote, will the PSNI still be recruiting from the Republic of Ireland? Yes, the PSNI will be recruiting from the Republic of Ireland. Any implications arising from Brexit are not yet known. As it stands, the only applicable advice available is as per the current Nationality Eligibility Criteria published on our website and those stipulations remain applicable until further notice. Do I have to be a resident in Northern Ireland to apply for the PSNI? Or a letter issued by the Home Office confirming that you have such status. You should note that you are required to be vetted as part of the recruitment process. If you have spent any time in the last three years outside the United Kingdom or Republic of Ireland you may have to provide a copy of your criminal record from the country / countries you have resided in. The process for checking varies from country to country. Where it is not possible to carry out necessary checks your application may not be processed further. I have not lived in the UK or Northern Ireland for 3 years; can I apply for the PSNI? Do I have to be fit to join the police? The role of a constable in the PSNI can be very physically demanding. As part of the recruitment process there will be a requirement to pass a Physical Competence Assessment (PCA) that will test your physical competency. The PSNI advises that you should start to prepare and build up your physical fitness now, and has provided further guidance here. Do I need any fitness qualifications? No, you do not require any fitness qualifications to be eligible for the role. Fitness will be internally assessed during a Physical Competency Assessment (PCA), details of which can be found here. I have read your guidance on the medical standards however can I get further information on the medical standards required and whether or not my specific condition will be accepted? Unfortunately we are unable to give any further details about the Medical Standards required to join the PSNI as each person invited to a medical will be assessed as an individual. Please see here for the standards. Please note it is not possible to comment on individual medical conditions at application stage, and we cannot put you in touch with PSNI Occupational Health & Well-being. Each case will be assessed individually, but this is only practical to manage if / when you are invited to medical. Do I need to provide documentation of any medical conditions? Yes, as well as completing the Medical Health Questionnaire, you are required to provide additional information in relation to any medical conditions you may have had in the past or are currently ongoing i.e. reports from a specialist. I am a serving officer in another police service in the UK- can I transfer to the PSNI? At this time it is not possible to directly transfer from another Police Service to the PSNI. Officers currently serving in other police services are free to apply to the current recruitment process, but no dispensation because of previous service will be offered during the recruitment process. I am a serving officer in another police service in the UK and plan to join the PSNI through the current recruitment process. If I am successful will previous service / pension be recognised? Officers currently serving in other police services are free to apply to the current recruitment process when open to applications, but no dispensation because of previous service will be offered during the recruitment process. When in training all Student Officers have to obtain the Advanced Diploma in Policing in the 23 week programme - and this effectively means all elements of the initial training need to be completed in full regardless of previous experience. Consideration is given to experience after the officer obtains the Advanced Diploma in Policing and attests - in terms of courses already obtained that may carry over and in addition consideration may be given (provided evidence and the legislation allows) to the waiving of the probationary period or length of probation to be served after successful completion of the 23 week programme. Regarding recognition of previous continuity of service and pension / salary consequences you should note that discussion on this matter can only take place on commencement of training and each case will be considered on an individual basis. Do I need a driver's license to qualify for the role? No, you do not need a driver's licence to qualify for the role. Can I apply to the PSNI if I have a pending application with another police service? / I am currently applying for other UK Police Services. Is there a restriction on applying to the PSNI at the same time? The PSNI will not restrict you from applying - you are free to apply to the PSNI as you wish. It is up to you whether you advise the other UK Police Service about your PSNI application, but PSNI Recruitment will not share details about any PSNI application with any external organisation without your authorisation. If my application to PSNI (or another UK police service) has been rejected in the last year can I apply to the PSNI again? There is no restriction to you applying if you have been rejected during any previous recruitment process. I am currently studying / have longer term personal plans. I am not due to finish / graduate until summer 2019/20. If I apply to the current recruitment campaign and am successful and offered a space in training can I defer my start date? You are welcome to apply to the current recruitment campaign when it is open. If you are successful through all stages of recruitment and are offered a place in training, PSNI is open to liaising with you and will consider all deferral requests. Deferral requests are considered on an individual basis. Deferral periods are granted on the understanding that they are only valid for as long as intakes from a given campaign would be active. Do I require any background knowledge, such as laws or legislations, at any stage during the application process? You do not require any previous experience or knowledge in order to complete the application form or any other stages of the recruitment process. I have dyslexia / a Specific Learning Difficulty / a disability - can I get help with the selection process? Applicants with dyslexia or a Specific Learning Difficulty who seek an adjustment in respect of the Initial Selection Test or Assessment Centre will be required to declare this intention at application stage. It is essential that you declare any requests for adjustments to testing during application stage and it is important to use the space provided within the online application form to make your declaration. You will be required to submit your most recent report from a qualified Educational Psychologist / appropriate qualified medical practitioner. Deloitte will set a strict deadline by which evidence must be supplied, so it is in your interest to collate all appropriate evidence now so that it is readily available when it is asked for. How will I know if I have applied successfully? Providing you have fully completed your application and submitted it online correctly by the deadline you will receive an on-screen confirmation message (we would encourage you to print or take a screen-grab of this on-screen message for your records). You will not receive an automatic or instantaneous email confirming receipt, however within ten working days of your submission we will email you to confirm receipt of your application. If you think you had problems submitting your application and fear that it did not submit successfully, rather than repeat/duplicate-applying please let us know by email and we will investigate. I had problems with the online application what should I do? Please email info@joinpsni.co.uk with full details and we will investigate. It will help if you supply details of the device / browser you were using to complete the application and details of any error messages on-screen. It might help if you retry the application in another device or clear the cache on your web browser. There may also be an issue with leaving certain page idle for a considerable period of time. So as to avoid the risk of missing the application deadline due to such unforeseen circumstance we would encourage all potential applicants to attempt their application early so that any such problems can be overcome. I participated in previous PSNI Recruitment campaigns and passed the IST. Are there any exemptions from the IST in future campaigns? Exemptions from the IST are not available and all applicants will have to participate in all stages regardless of previous participation in PSNI recruitment testing. Is there negative marking in the IST? No, there is no negative marking for either sections of the IST. How many tests am I required to take for the IST? There are two parts to the IST- the Situational Judgement Test and the Verbal Reasoning test. Neither of these tests require you to have any prior knowledge about the duties of a Police Constable. What if my internet goes down when I am completing the online IST? We ask that you ensure that you have a strong internet connection when completing your online IST. If however you lose internet connection or are disconnected from the test for any reason, do not worry. The system will handle such instances so that your progress to date is captured. To continue with your assessment please ensure that you have a stable internet connection and then re-click your access link and you will be able to restart your assessment from where you left off. I do not own a PC, how will I be able to complete the IST? You must have access to the internet to complete the IST. Therefore, we suggest that if you do not own a PC you should seek the use of one from a public library for example. We would recommend that you complete the IST on a PC or laptop. Tablets can be used. How long will it take to receive my results from the IST? During the IST process we will give you an indicative date by which you should expect the results. We would ask for your patience while we process results. Please remember that you will not receive an automatic email to confirm the completion of your IST, but providing you follow all on-screen instructions your submission will be registered. we will not be in a position to confirm IST completions on an individual basis during the open IST phase. When can I access practice questions prior to the doing the online IST? Practice IST questions can be accessed here. As well as this briefing and practice document you will also have the opportunity to complete practice questions and get general familiarity of the online system when you login to the IST portal. The online IST system is very straightforward and user friendly, you just need to follow the instructions to begin your test and access the practice questions. The briefing and practice document provided is the only practice material which we can provide in advance of your IST. There is a wide variety of similar practice tests available on the internet, which you may find useful to help you prepare. I will be on holiday / unavailable / unable to complete the IST during the dedicated online IST phase – what should I do? Applicants will be expected to complete the online IST during their allocated window of opportunity. Given that the IST is to be conducted online and given that it can be completed at any time day or night during the phase, we anticipate that all applicants will endeavour to fulfil the requirement to complete the IST as instructed. Requests to reschedule the online IST will only be considered in very exceptional circumstances, e.g. due to bereavement. What do I do if I need to reschedule my AC? Given the large number of candidates it will not always be possible to reschedule allocated appointments. Any requests for alternative appointments must be made as soon as possible by email to info@joinpsni.co.uk and must include a reason for the reschedule request along with your name and UID number. On receipt of your request, we will consider whether any alternative slots are available and you will receive a response from us by email within 10 working days. We are not able to discuss reschedule requests over the telephone. You may be required to provide evidence in support of your request to reschedule. What does the Assessment Centre involve? If you pass the Initial Selection Test, you will be given an appointment to attend an Assessment Centre. The Assessment Centre requires you to assume the role of a constable and consists of a number of different exercises (including written exercises and role plays, a re-test of the Initial Selection Test, as well as assessing your competence in technology). The Assessment Centre is designed to assess you against the personal behaviours for a constable which you can find more detail on in the Guidance for Applicants (1MB). What is the dress code for the Assessment Centre? There is no specific dress code for this stage of the process but many people choose to wear business attire (e.g. business suit with shirt and tie for men and business suit or equivalent for women). Do not worry if you do not own a suit as there is no strict rule in this regard and you are free to wear whatever you wish to the Assessment Centre. How much notice will I get before the date of my assessment centre? Deloitte will endeavour to give applicants reasonable notice of upcoming events, although due to security arrangements it may be necessary to hold invitations until as late as 1 week before your appointment. How long will it take to receive my results? On the day of your Assessment Centre we will give you an indication of when you will receive the outcome of the assessment. Is there an interview involved in the AC? There will be no traditional style / experience based interview during the assessment centre. Full details of the exercises you will complete will be provided in advance of your assessment centre so you know what to expect. What do I wear to the PCA? You should wear suitable training shoes and clothes which will allow you complete the PCA comfortably. If I fail the PCA, is there an opportunity for a retest? If you fail the PCA on the first occasion you will be given one more opportunity to complete the assessment within a twelve week period. If you do not pass the PCA Re-test, there will be no further opportunities to take the test. Am I required to attend the familiarisation event? Although the PCA Familiarisation Sessions are voluntary, it is highly recommended that you attend in order to become familiar with and practice the PCA elements. The PSNI’s PTIs will also offer advice relating to your PCA performance and appropriate training. Will the PCA include the push-pull exercise for the new campaign? The push-pull will not be tested as part of the PCA during the 2017 recruitment process. There are two distinct types of vetting: Police Vetting and National Security Vetting (NSV). Police Vetting and National Security Vetting are separate processes, designed to counter specific threats. The purpose of Police Vetting is to specifically provide a level of assurance, which NSV cannot provide, as to the integrity of individuals who will have access to the police estate, its assets and or infrastructure. The purpose of NSV is to protect sensitive government national security assets by providing an acceptable level of assurance as to the integrity of individuals who have access to protectively marked government assets and/or who require access to persons, sites and materials at risk of terrorist attack. How long does vetting take? Vetting is a complex process and requires various checks to be completed. This includes everyone declared on your vetting applications as well as your wider extended family and other close associates. All applications are considered on their own individual merits. Dependent on your personal circumstances your vetting may take longer than others. Will I be contacted during the vetting process? Anti-Corruption & Vetting will not routinely contact applicants during the vetting process, applicants will only be contacted if information has been omitted from your vetting application or if anything arises during the vetting process which require the applicant to clarify. Any queries in relation to vetting status should be referred to Police Recruitment. You will be advised of your vetting outcome. If I am a non UK resident will vetting take longer? Yes, as part of the vetting process there is a requirement for the PSNI to carry out checks with other Police Forces and agencies. PSNI are dependent on these organisations responding on a timely basis. If you have spent any time in the last three years outside the United Kingdom or Republic of Ireland you may have to provide a copy of your criminal record from the country / countries you have resided in. The process for checking varies from country to country. Where it is not possible to carry out necessary checks your application may not be processed further. What if my circumstances change during the recruitment process? It is your responsibility to ensure that you inform the HR Recruitment team of any change of circumstances. Once you pass to the PSNI managed stages of the recruitment process all changes are handled only by Police Recruitment. Will my social media accounts be looked at? As part of your vetting application you are asked to provide your personal email addresses as well as details of various social media accounts. This information will form part of the vetting process. Any information found as a result of these checks which is believed to raise concerns regarding your suitability will be considered in the same manner as all other information available to PSNI in ensuring that appropriate personnel and decision-makers within PSNI have all relevant information available to them. Do I need to declare spent convictions? Yes, all convictions whether considered spent or not must be declared. The vetting application specifically asks for you to confirm that you understand that you must declare all spent convictions. Non-disclosure of certain offences/convictions could lead to the rejection of your vetting application. Do I only declare a partner if we live together? No, the term ‘Partner’ includes a fiancé(e), a person to whom you are married or with whom you live or have lived with in the last three years, a person whom you have been in a relationship with for more than 12 months in the last three years, or any former partner from whom you have separated or have been divorced from in the last 3 years. What if my vetting application is rejected? If during the vetting process there is information that gives cause for concern with regard to an individual’s suitability, the matter will be referred to the Vetting Panel for a decision. If the Panel is of the opinion that the candidate is unsuitable the candidate will be informed of this by letter and told that they may seek, in writing, to have the decision reviewed by the Independent Assessor. On receipt of a report from the Independent Assessor, ACC Legacy & Justice on behalf of the Chief Constable may take such action as they consider necessary. This will include consulting the Independent Assessor and advising of the final decision. If it is decided that the candidate is unsuitable this will be the final decision on the matter. There is no further avenue of appeal. What information do I need to supply at the medical assessment? The Medical Health Questionnaire should be completed in full by yourself and your GP. Please note the GP should only sign the MHQ after you have completed your sections and signed. As mentioned in Medical Standards any additional medical information is also required. What will the medical consist of? If appropriate you may also be seen by an Occupational Health Medical Adviser, who may in some circumstance carry out a physical examination. How long will the medical assessment take? This usually lasts up to 1 and half hours. If I get laser eye surgery will I meet the eyesight standards to join the PSNI? The operation corrects visual acuity to meet the PSNI eyesight standard. Recovery is rapid and PSNI do not have strict post-surgery time limits for considering your application. As a general rule the PSNI like to see stable vision for about 3 months with no side effects (post-op) before offering a candidate employment. The candidate simply has to meet the standard when they present for medical. We cannot offer advice on the variety of laser eye surgery options available. At what stage of the assessment does the drug test take place? Why have I to have a substance misuse test? As per the Police (testing for Substance Misuse Regulations (Northern Ireland) 2008. The Police Service of Northern Ireland (PSNI) is committed to the provision of a safe, healthy and productive working environment, and does not in any way condone the misuse of drugs, whether illegal or prescribed. Any individual involved in the misuse of drugs exposes themselves to vulnerability in terms of corruption, blackmail and integrity and faces disciplinary and criminal consequences. As part of the recruitment process there is therefore a requirement for candidates to have a substance misuse test. Why do they take a sample of hair? This is the industry standard and in line with European Workplace Drug Testing Society legally defensible workplace drug testing guidance. Will I be advised of the results of the substance misuse test? Yes, Police Recruitment will inform you if you have passed the Substance Misuse Test stage. If you have a confirmed positive Substance Misuse Test you will have the right of appeal. How do I provide a sample? Pre-employment substance misuse testing will usually be undertaken by collection of a hair sample. The substance misuse test will be undertaken by an approved, qualified, external contractor of the Police Service using appropriate sample collection kits and observing industry and evidential standard chain of custody procedures. This test will be undertaken by the collection of 2 samples of hair of 3cm in length and containing at least 50 - 100 strands of hair per sample. This will primarily be taken from the head, however, on occasion armpit or chest hair may be used. The only exception to this will be where prior information has been provided as to why the applicant cannot provide a sufficient hair sample. In these instances a urine sample will be required to be provided. Applicants who provide a urine sample will be required to provide a further three random samples over a 6-month period. What happens if I cannot provide a sufficient hair sample? If you have concerns regarding provision of three centimetres of hair, or have medical or religious reasons that would prevent you from completing the test you should write to the Substance Misuse Manager, Anti-Corruption & Vetting, Police Service of Northern Ireland Headquarters, Brooklyn, 65 Knock Road, Belfast, BT5 6LE outlining the reasons why you are unable to provide a sample. What happens if I fail the substance misuse test? You will be informed in writing of a confirmed positive result. You will have 7 calendar days to notify PSNI that they wish to have their retained second sample analysed by an independent laboratory. In these circumstances you must identify the laboratory. The laboratory must be accredited by a recognised external accrediting body. Once the laboratory has been identified the second sample will be forwarded by the Police Services external contractor. Where you request that the sample is analysed by a different laboratory, you will be liable for all costs incurred in testing of the second sample. Where analysis of the second sample results in a negative result, a further test will be arranged. This test may be undertaken by collection of a urine or hair sample. In the event that this second test returns a negative result, the initial positive result will be regarded as a false positive. Where a false positive is recorded, the Police Service will reimburse any costs associated with analysis of the second sample. Deliberately attempting to obstruct the process will be treated as failing the test, and no re-test will be provided in these circumstances. I have questions about my Pay and Benefits, where can I get more information on this? Please visit My Salary and Benefits to read more about your pay and other benefits that you might avail of when joining the PSNI. Successful candidates will be provided with the most recent pay scales on appointment. Can I indicate my preferred location to work as a student officer? When receiving an offer of employment Student Officers are given the opportunity to express an interest in serving in a specific Policing District, however all allocations to a Policing District will be based primarily on organisational need. PSNI HR allocates Student Officers to a Policing District, and local management allocate to an individual station. Student Officer allocation depends on the resourcing needs of the Districts at the time of the offer of employment. Resourcing needs are determined by District vacancies based on future known appointments, promotions and transfers. When will I know where I will be posted? Student officers are advised of their allocated district at the Induction Day. Once I start serving in my District, what shifts will I be required to work? As a Local Policing Team (LPT) officer you will be required to work a variety of early, late and night shifts on a five week shift pattern. In a typical five week period you can expect to work approximately 7 early, 5 late and 9 night shifts. You can expect to work three or four of any shift at a time and then receive rest days. I've booked a holiday during the 23 week training course, is this an issue? Leave cannot be permitted during the 23 week training course. When receiving an offer of employment Student officers are asked to confirm availability to attend the full 23 week programme. Student officers can request to defer their intake to a later date due to a pre-arranged holiday or specific pre-arranged event (e.g. wedding). Deferrals are considered on an individual basis. If I fail any part of the 23 week training course, do I have to repeat that section? Student Officers are asked to sign a declaration to acknowledge that failure to pass exams and assessments will result in Student Officers having 1 re-sit attempt within a specific timeframe. Failure in the re-sit may result in the Student Officer being asked to leave the course. Is the residential part of the 23 week training course mandatory? There is no obligation for a Student Officer to reside at the Police College during the Training Programme. You can request to stay at the Police College if you wish, however there will be certain criteria that you must meet in order to qualify for accommodation (e.g. you have to travel a distance of 35 miles or more, welfare issues etc.). Only those granted a room at the College will be permitted to stay over at the weekends. If you would like more information on the recruitment process you should read the Guidance for Applicants booklet, which is available for download here. To help you with the application process, we’ve created various documents below which you might find useful. Click on each of the documents below for more information.